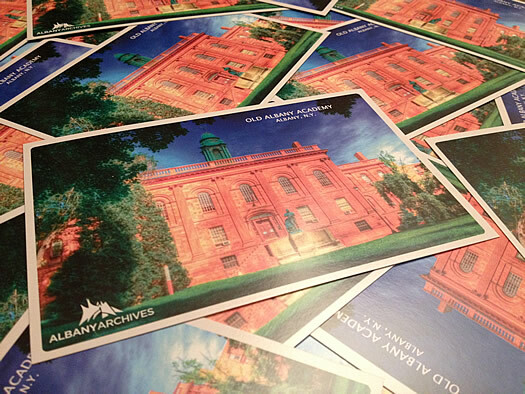 If you haven't been following @AlbanyArchives on Twitter, you've been missing out. It's an ongoing stream of local history facts, photos, docs, and assorted bits delivered with humor and the occasional goofy photoshop of a historical image. With the Albany I Spy downtown Albany scavenger hunt nearing its end -- the winners will be announced this Saturday at 2 pm at the City Beer Hall -- we figured it'd be a good time to pull back the curtain and find out more about the person working the levers of Albany Archives. What can you tell us about yourself? And why the anonymity? I was born here in Albany, but moved to Syracuse when I was still a kid. About 11 years ago I was given the opportunity to move back. Along with being into history, I'm also a pretty big movie buff. It's pretty apparent in a lot of the Albany Archives tweets. I'm also a pretty avid runner, just completing my first marathon last month. Tying into the history aspect, I also dabble in some ghost hunting from time to time. Sometimes history actually does come alive! The anonymity just makes it easier. Plus, with my line of work it serves as a bit of protection. A little mystery never hurt anybody (unless you were Mr. Boddy in the Dining Room). Besides, it shouldn't really be about me. The focus should be about the people, places and things that make up the history of our area. You have an obvious love for the history of this area -- how did that develop? My grandfather had a lot to do with that. When I was a kid he'd take us (my cousins and I) to the New York State Museum. So many memories of those creepy wax lumberjacks and sitting on the subway car. I was also lucky enough to have some pretty great teachers growing up that made history interesting. After watching "Lincoln" in the theaters last November, I decided to start Albany Archives. He made reference to the city of Albany and I was curious why he would do that. Did some research and stumbled on to a blog telling the story of Lincoln in Albany and it was absolutely spell-binding. I thought to myself, "How did I never know this!? People need to know this stuff!" A lot of the great stuff is completely accessible here, too. Go down to the Olde English Pub and have a drink in a 280-year-old house. Have dinner at Jack's. The corner that restaurant sits on is older than almost every city in America. The great thing about local history is that it's quite literally on your doorstep. You don't need to travel great distances to see where George Washington visited or where Joseph Henry became a scientific superstar. You just need to open your front door and take a walk. Look around, read the plaques that litter almost every city street in Albany. Look up even, you might be surprised with what you'll see. This is an amazing city for history and architecture. How do you go about picking subjects and digging up material? For the planned Albany Archive tweets, they generally follow a "Today in History" format. It's easier to do it that way. Along with this type of format we celebrate birthdays and deathdays. Let's be honest, any day we can see a picture of a John Boyd Thacher wearing a Photoshopped birthday hat, it's probably going to be a good day. Sometimes it's also just nice to see a really old photo for no rhyme or reason at all, and that happens a lot too. The internet is a wonderful place for material. There are a lot of old books that have been digitized which saves me a lot of time of heading down to the a museum. Don't get me wrong, I still do it the old fashioned way too by hitting the books at the New York State Museum. The amount of books they have is staggering. So much about history seems to be long backstories, so picking Twitter -- which is all about concentrated expression -- as the initial medium for this project was an interesting choice. What prompted that choice? Young adults in general know so little about the history of their own city. It's not their fault, there just isn't a lot of faucets on the topic. That's where social media comes in. A lot of my generation is into social media, and that's the easiest way to reach them. It's not always ideal so I try to narrow it down to the most interesting or important points of the story. From a writing standpoint it can be pretty challenging. Each tweet needs to stand on its own and there are only 140 characters to get across that complete thought. What's your favorite local historical story/fact/person? Probably my favorite local historical story would be the 1861 visit of Abraham Lincoln. I've always been a Lincoln fan (it's hard not to be! ), then you pepper in the fact that John Wilkes Booth was performing at a theater a few blocks from where Lincoln was and both staying in hotels on Broadway? It's just too good! My favorite fact? It would have to be the age of Albany in general. We're 400 years old. Four hundred! We're just so darn old! Theres only a really small handful of cities that can claim that. We should wear it like a badge of honor. 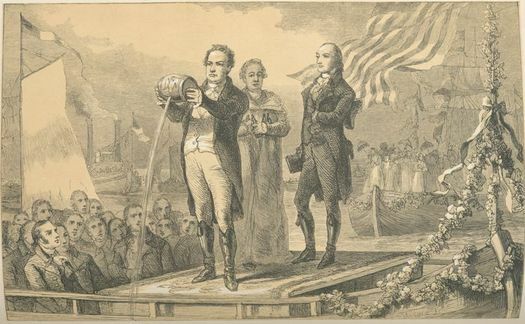 DeWitt Clinton "mingling" the waters of the Atlantic and Lake Erie, celebrating the connection made by the Erie Canal. Easily my favorite historical person is DeWitt Clinton. It's a love affair that goes all the way back to 5th grade. My malcontent of a teacher had her students all write an essay on a famous American. I chose Clinton. Why? No idea. It's not exactly a name that jumps out and says "Father of Our Country." Looking at his life in a nutshell though, what he did for the city of Albany and the state of New York is nothing short of remarkable. The Erie Canal was a 19th century marvel. Plus, any time I walk past the old Jillian's I feel the need to tell my friends that that's the site of De Witt Clinton's home while he was governor. They MUST be sick of that by now. What are your plans for the future of Albany Archives? One "future" plan finally got off the ground last week (June 6th). Albany Archives had its first guest contributor. Every Thursday another local history nerd, Monica Mercado, tweets on women and how they helped shape our area. We affectionately call it "Ladies Night." That will be going on all summer. Eventually I would like to get into some longform stuff. Not a lot, but just enough to further flesh out some stories that I feel need to be told. The last thing, and probably the one project I've had sitting in the fire the longest is doing some video segments. I won't give up any details, because it very well may not happen, nothing has been finalized. If everything comes together the way it's shaping up though, history nerds eyes are going to pop from their skulls and their brains will melt out of their ears. History, especially local, is usually portrayed as dull, drab and dry. It doesn't need to be. My number one goal is for Albany Archives to be educational. However if it can squeeze a few laughs out of you too, I've done my job. Local history can be fun. I've always had the thought process that the best kind of learning happens when you're enjoying it, entertained by it and you're invested in it. Everyone is invested in local history. To some degree, I think everyone wants to know where they came from. Who walked these streets before me? What was on that corner before that empty parking garage? What was this city like when my ancestors started their families here? This is as much their town as it is ours now. The only reminder you'll ever need is seeing a river of brick under one of Albany's broken asphalt streets. Interview conducted via email. It's been lightly edited. And, yep, we've been helping to get the word out about the Albany I Spy scavenger hunt, because it seemed like a fun idea. I've been following the Twitter Albany Archives for a while and I love learning more about the history of Albany. Thanks for that and keep up the good work! 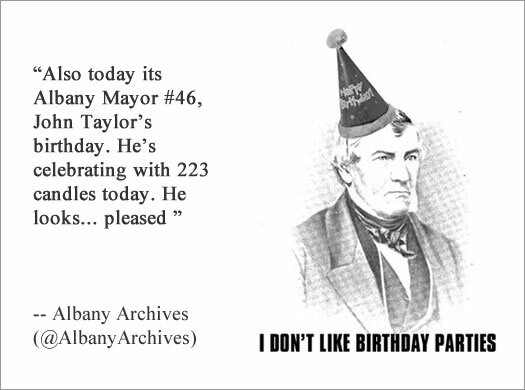 I can't promise Emma Willard in a photoshopped birthday hat, but I love being a part of Albany Archives. Great interview, all! Awesome interview! Great to hear more from our favorite person on twitter. Hey folks.....I know who the mystery author is of "Albany Archives"!! But if I told you, then I'd have to kill you....and I hate bloodshed...so guess you're all out of luck. However for $10,000,000, I MIGHT be tempted to let it slip! !